When it comes to something as ultimately, and often intentionally, ephemeral as pop or rock music, “substance” is not a word that should be chosen lightly. But I think the National’s ardent fan base would agree that the band, composed of Matt Berninger and the brothers Dessner (Aaron and Bryce) and Devendorf (Scott and Bryan), has always made substantial music. Like few others, the National’s songs inspire devotion, enthusiasm, and intense listener engagement, all manifested in unironic, fist-pumping joy at their live shows (at least the one I saw in Cincinnati in 2007) and huge anticipatory buzz for each new National album. The National’s new album deserves every bit of buzz it’s managed to generate. High Violet is a profoundly moving document of an already-great band’s astonishing growth. In its words and sounds, the album provides the soundtrack for the tender, perilous, inevitable passage from post-adolescence into unqualified adulthood. It conveys very singular, personal perspectives while effectively telling the more universal story of the challenges and tensions that confront a generation. It even manages to portray the delicate, beautiful moment when withdrawal becomes renewal, when one realizes that past failures and frustrations can actually provide the wisdom and insight needed to step back into the world with one’s humanity more fully formed. I’m a relatively new fan of the band, beginning casually with Alligator and passionately with their 2007 masterpiece, Boxer. I still haven’t really listened to the earliest stuff, though I have gone back and realized that Alligator is another important album (another word that shouldn’t be thrown around lightly, of course). My point is that fans with a more thorough familiarity may hear High Violet differently, of course, and I recognize that with a band as great as the National, comparing quality between albums is all a matter of small degrees anyway. That said, for several reasons, High Violet is my favorite National album yet. And I’m guessing it will remain at or near the top of my “favorite albums of (insert time period here)” lists for quite some time. For one, I hear increased attention paid to composition, arrangement, and dynamics on High Violet compared to earlier National efforts. Among dozens of examples, witness the haunting, cooing harmony vocals on many tracks, including “Terrible Love” and “Sorrow.” Or the lovely strings-and-brass backing of “Runaway.” Or the strange, snaky, repetitive, manipulated guitar figure that adds an extra layer of menace to the already-unnerving “Afraid of Everyone.” Or how about the slow-burn tension of the slightly noisy, droning intro to “Little Faith,” which gives way to twinkling piano for a measure, and then the song gradually builds back the rising drama with a wide range of instrumentation, both traditional guitar-bass-drums and full-sounding orchestral accompaniment. One final point on High Violet‘s sounds–Matt Berninger’s voice has evolved into, quite simply, a wonderfully expressive instrument. He’s always done well at raw-throated anguish, the most famous example being the howl of “My mind’s not right! !” throughout “Abel,” one of Alligator‘s signature tracks. And his more commonly employed deadpan baritone was nothing if not distinctive on earlier albums. But now, I hear and feel so much more coming from Berninger’s vocals—he’s developed a bit of a higher register that he employs to great effect, and he adds many little flourishes and lilts to single notes that, for me, enhance pretty much every song’s emotional impact. Finally, it’s impossible to discuss the National without mentioning Berninger’s distinctive lyrical prowess, displayed as effectively as ever throughout High Violet. One could pull out examples from every song, of course, but I’ll focus on two passages that, for me, lift up High Violet into the pantheon of recent Great American Albums that will one day be held up as fine artistic documents of the strange, frightful, thrilling challenges of the early 21st century. These odd, stirring lyrics are striking enough on paper, but when Berninger sings them in the most empathic voice I’ve ever heard him conjure, over soaring strings and a gospel-tinged choir of backers, “Vanderlyle…” ends up sounding like the comforting words of a friend who has been to the brink with you and is now welcoming you back. The one who reminds you that, no matter how screwed up everything can seem both internally and externally sometimes, “the same small world [will be] at your heels” when you’re ready to begin again. For me, because it’s full of both sides of this golden moment of reemergence—the pain and the redemption—High Violet is a substantial work of art that perfectly captures the spirit of our times. The album soundtracks the low moments of being awash in bleakness and frightful uncertainty, but it also conveys the resilience and the emerging hope of many of those who inhabit and will define our era. 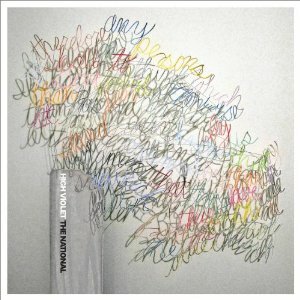 With High Violet, the National hasn’t just released a great new album. The band has done its small part to feed a hungry age. This kind of album review sells albums…to me. You’re the first reviewer to give me a “substantive” reason to finally check out The National. Thanks. Sounds very similiar, musically and lyrically, to mid period Swans. The singers voice and phrasing is very similiar to micheal gira. oddity. Have you played any gigs out, any house parties, any school dances.